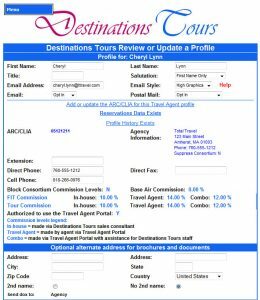 Travel Agency Master profiles can be tagged with a consortium and an optional sub-affiliation. The sub-affiliation can be custom created to reflect affiliated travel agencies, each with their own Travel Agency Master, usually reflecting a joint marketing agreement. For Travel Agency Masters without an ARC/IATA appointment, TravelHerd will assign a Pseudo ARC number. Travel Agency Master profiles may also be tagged with marketing and/or interest tags. Marketing tags are designated in TravelHerd by your company and assigned; they can be based on list sources, trade show promotions and other industry-defined matters. Interest tags are designated in TravelHerd by your company but self-affiliated by the profile, e.g. European Travel, Safaris, Family Holidays, as needed. TravelHerd profiles may carry multiple marketing and/or interest tags and are used to target your company’s sales and marketing efforts. Travel Agency Branches automatically inherit all tags from their associated Travel Agency Master and are updated as additions, changes and deletions are made to the Travel Agency Master. Additional marketing and interest tags can be added to a Travel Agency Branch as needed. Travel Agents with an ARC/IATA number inherit all tags from their associated Travel Agency Master and Travel Agency Branch, if a branch exists. Additional marketing and interest tags can be added to Travel Agents as needed to reflect their specific situations, e.g. attended a specific seminar or traveled on a specific fam trip. Travel Agents without an ARC/IATA number can be tagged with marketing and interest tags as needed to help identify their source. For Travel Agents without an ARC/IATA number seeking to make a reservation, it is required to associate their profile with a Travel Agency Master or Branch. Direct Consumers can also be tagged with marketing and interest tags, e.g. specific brochure requested, consumer trade show attended or social/professional affiliation (Rotary Club, AARP or local trade group). TravelHerd reservations are tracked by the individual Travel Agent profile as well as any associated Travel Agency Master and Branch. Sales territories can be set up based on ZIP range or State/Province code; Travel Agency Masters are auto-tagged in this process. As trade and consumer profiles in TravelHerd incorporate email addresses, postal mail addresses or both, they can be used in list segmentation extraction for email marketing and postal mailing lists.